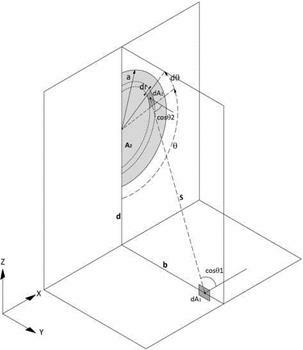 To help visualize the results of this research, some formulas have been programmed by the authors in Matlab® computational language, which greatly enhances understanding of radiative exchange between emitting surfaces and receiving planes. 3D graphs have been produced for a generic semicircular emitter. 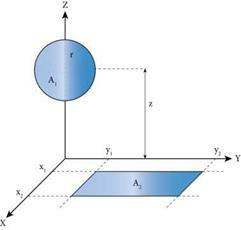 Figure 7 shows a generic semicircular emitter that gives energy to a perpendicular plane in its base. Thanks to this new configuration factor, several radiative properties for these shapes can be clarified. For instance, a semicircular emitter is not capable of transferring more than 50% of its energy to a perpendicular plane; this is particularly important in some engineering lighting applications, such as lighted vaults or tunnels. Let us consider the proposed figure. In order to determine the radiant interchange between an emitting circle, which lies in the plane ZX, and a point P situated in another parallel plane XY, the following coordinate system is proposed (Figure 2). 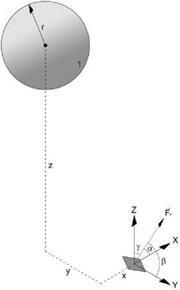 d: vertical distance between the center of the emitting circle and the plane XY. b: horizontal distance between differential element dAj and the plane ZX that contains the said circle. Relevant terms in equation (1) are depicted in figure 1. Many architectural examples rank among masterpieces for its beautiful and harmonious use of solar radiation. However, their creation had to rely solely on intuition because they possessed a curvilinear nature. 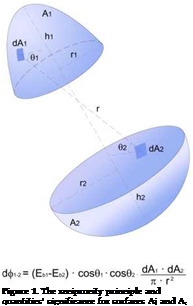 As the necessary tools required for evaluating shapes derived from the sphere or the circle were not available, such forms could not be assessed. Improving the solar panel energy efficiency by cleaning the solar panel was undertaken to study the energy output efficiency for the non-crystalline, monocrystalline, and polycrystalline solar panel with and without the emulated rainfall. The weather in Taiwan is rather humid; the dust in the air is thus easily moistened, adhered to and accumulated on the solar panel, s surface to interfere with the solar panel’s energy efficiency. On-site observations reveals that raindrops were somewhat effective in cleaning the solar panel surface. Hence, a water spraying system was installed above the solar panel and operated once every week to study the effectiveness of cleaning by rainwater. The results are shown in Figure 9.